C. Judrin, Inventaire des dessins du musée Rodin, vols. I-V, Paris, 1992. C. Buley-Uribe, Rodin, The Light of Antiquity, exh. cat., Arles, 2013. The present watercolour is part of an exceptional series of fifteen drawings commonly known as “femme-pyjama”, showing a dancer dressed in loose-fitting clothes. At the instigation of English artist and socialite Esther Sutro (1869-1934), part of the series was shown at the Royal Institute of London in 1901 during an exhibition of the Pastel Society (cf. Buley-Uribe, op. cit., p. 249). The dancer portrayed is believed to be Mlle Camillot-Prévost, whom Rodin described as “the little Spanish dancer” and whose references he’d jotted down in one of his notebooks of models. The naked torso, taken in itself, was one of Rodin’s favourite themes toward the end of the 1890s, as his numerous “vase-women” indicate. The series is special in that it depicts a single model in a series of slightly different poses; it’s also unusual in that it anchors the gaze on the torso itself. Uncovering her body, the model leans her head sometimes to the right, sometimes to the left, in an undulating motion. The torso is the subject of each drawing, with the dark oval of the pantaloons serving to isolate the bust and make its contours stand out sharply. Rodin intentionally showed these drawings as a series in order to emphasize the fact that it was the fragmented body that interested him, and that it was seen at its best from the sort of distance imposed by a serial display. From that distance, it’s the evolution of the white torso that first strikes the eye. In some of the drawings, the hands and feet also stand out, as if isolated from the body, somewhat like his grafted “abattis” or separately sculpted body parts, which were also inspired by fragmentary antique sculpture groups” (Buley-Uribe, op. cit., p. 249). In this drawing, the model has adopted almost the same pose as another “femme-pyjama” in a drawing held in the Rodin Museum (D.4582), but here the treatment of the clothing is distinguished by a lovely marbled effect suggestive of a lavish fur coat. 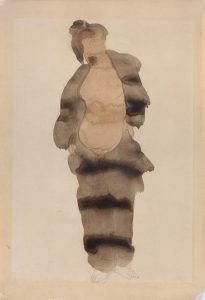 Of the series, seven drawings are held in the Musée Rodin, Paris, whilst one is in the State Museum Weimar (inv. no. KK1264), and one in the Maryhill Museum of Art, Goldendale (ill. In Burey-Uribe, op. cit., p. 249).